A lot of Southeast Asianists are watching current events in Egypt with some interest. Even nonexperts are weighing in with their opinions on the parallels between Egypt 2011 and Indonesia 1998. It’s amazing, I get on a plane in Chicago and Mubarak is in power, I get off a plane in Tokyo and he’s gone. We here at Indolaysia have been feeding our family for the past several years based on our understanding the collapse of Soeharto’s New Order, so we have some understanding of what is at stake. an economic meltdown that (1) precedes the political crisis and (2) came on the heels of strong performance. Egyptian economic growth has been pretty good for some time; Indonesia’s from 1990-1997 had been spectacular, but from 97-98 the turnaround was abrupt and dramatic. an acceptable status quo. This follows from the previous point. The whole system in Egypt is rotten. The whole system in Indonesia was rotten too, but calls for regime change came after the realization that it would not be easy to keep the system together, which many people (and yes, this means many ordinary Indonesians too) would have found quite satisfactory. a united and sustained protest movement. Without taking away from the sacrifices made by the Pahlawan Reformasi at Trisakti and the mass protests in Jakarta and elsewhere, my sense is that what we are seeing in Egypt is of a different scale altogether. This is more like People’s Power in the Philippines. I could be wrong. an external patron whose foreign aid comprises the life blood of the country’s elite power structure. Egypt has one (the US) and Indonesia did not. My understanding is that Madeleine Albright called Soeharto shortly before he resigned but she couldn’t have done much to hasten his decision; no threats of withholding aid would have had much leverage on him. If Mubarak isn’t already in exile now he’s going soon. When Soeharto resigned he got in a limo and headed back to his house, where he lived for another decade. this final point isn’t easy to pin down but I think it’s probably important. There is no ethnic Chinese problem in Egypt. There is a Coptic Christian problem but that seems altogether different. The spasm of violence that eventually dislodged Soeharto from rule was articulated through rioting masses targeting a visible and economically dominant minority. I don’t see that happening in Egypt, although I do think it’s probably possible to expct some pretty nasty violence against the symbols of the Mubarak regime if things don’t move along quickly. The better comparison, to our way of thinking, is Mubarak-Marcos. But even that isn’t perfect. All of this isn’t to say that there aren’t some similarities that we should take into consideration. I’m proud to cite a longtime Indolaysia crony with a very smart editorial in the International Herald Tribune on the risk of mass violence if the army abides–he draws on Indonesia as a comparative case. He’s right and it’s a smart comparison. But I don’t see the endgame in terms of authoritarian collapse playing out similarly between Egypt and Indonesia. And yes, I am implying that the endgame hasn’t played out yet in Egypt. Our second comparison for today is a lot less serious. Heading back to Tokyo for another quick trip, I arranged to fly ANA instead of Continental. This was a much better idea. First, I learned something: Japanese people pronound ANA “Anna” instead of “Ay-En-Ay”. Second, the food is superior: no grit in my kale this time, although on the other side of the ledger there was no cheese course on ANA. 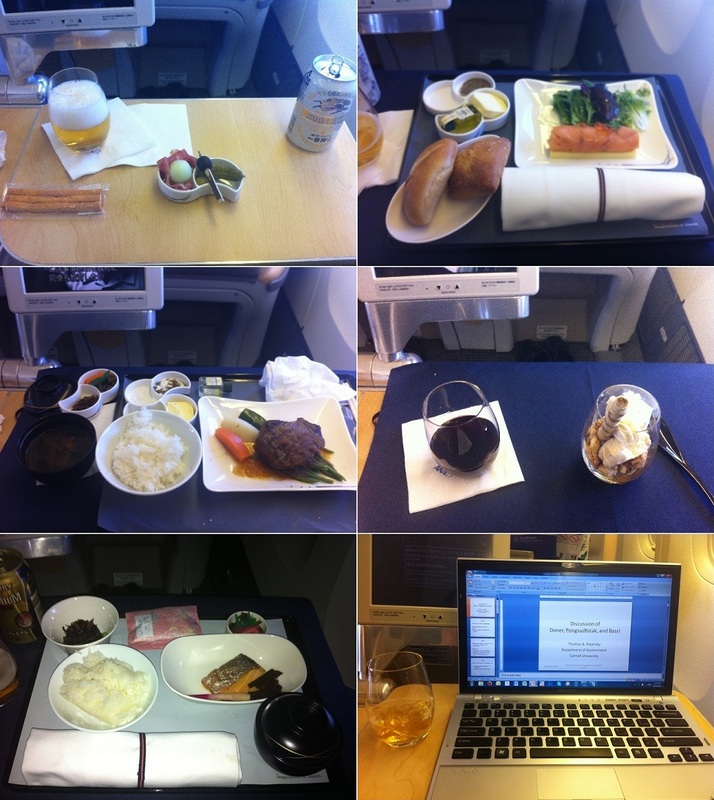 Third, the service was waaaaay superior on ANA. Another interesting discovery was Japanese plum wine, which until today (or was it last night…jetlag has me all confused) I always avoided because I reckoned that it would be something like sloe gin, which as far as I am concerned is a poison. On the contrary, plum wine is quite tasty. Let’s hear it for Nanko Ume no Kodawari Umeshu provided by Oyama Yumekobo Hibiki no Sato.